I was visited of the Lord, and tasted and knew of the goodness of Jesus. Within the space of 400 years, the people of Lehi descended from inexpressible joy in the presence of the Savior of the world to inexpressible misery in the thrall of Satan. In Mormon’s words, they went through a “complete revolution,” an utter about-face from the arms of the Savior into the chains of the Devil. When Jesus was among them, the happiness they felt was beyond their ability to describe: “No tongue can speak, neither can there be written by any man, neither can the hearts of men conceive so great and marvelous things as we both saw and heard Jesus speak; and no one can conceive of the joy which filled our souls at the time we heard him pray for us unto the Father.” Words failed them in their attempt to define the depth of their joy. The revolution did not come all at once. It was a gradual process with apparently innocent beginnings. Pearls have always been a source of wealth in Central America, from the Sea of Cortez to Panama . A pearl found in Las Perlas Islands off Panama was said to weigh 250 carats, and the Conquistadors exported huge quantities of pearls to Spain . To the Nephites, the possession of fine pearls became a status symbol. What bitter irony to trade the kingdom of Heaven for a pearl, when the Savior had clearly taught that the Gospel is the “pearl of great price,” worth all that we possess. Once pride of possessions had entered the hearts of the people, “from that time forth they did have their goods and their substance no more common among them. And they began to be divided into classes.” Class divisions are motivated by selfishness, Mormon makes clear. 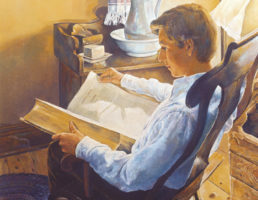 The class division came about “because of the pride of their hearts, because of their exceeding riches, yea, of their oppression of the poor, withholding their substance from the hungry.” All of a sudden the mindset of the Nephites shifted from “ours” to “mine.” The concept of sharing was abruptly abandoned. Common ownership of goods and substance disappeared, a sign of the loss of love for one another among the rapidly degenerating former followers of Christ. Class divisions soon became divisions into parties and tribes. Those who rejected the Gospel outright came to be called Lamanites; those who held on to the Savior were called Nephites. It’s interesting to point out that this division was apparently not a matter of family descent, but a political-religious choice. The enmity between these two parties became more and more bitter until “both the people of Nephi and the Lamanites had become exceedingly wicked one like unto another.” There were no longer good guys and bad guys-they were all bad guys. Perhaps the most remarkable thing about this slide from God to the Devil was its rapidity. 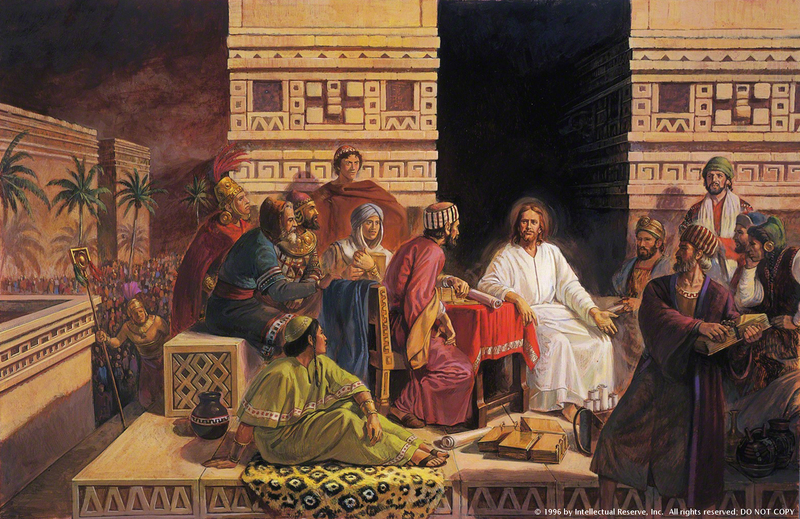 Mormon indicates that the first problems arose in “the two hundred and first year”; by the time “two hundred and ten years had passed away there were many churches in the land.” It took only nine years for the followers of Christ to wander off into a sort of generalized state of iniquity. The foundations of their economy, however, were selfishness and corruption. “Gadianton robbers . . . did infest the land.” An economy built on organized crime is of course totally untrustworthy, so the people “began to hide up their treasures . . . and they became slippery, because the Lord had cursed the land.” As I write this lesson, I’m forcefully reminded of the predatory behavior of powerful interests in our own day who have recently brought to us a global crisis of trust-and the savings and investments of millions of people are now quite “slippery. Mormon’s account of the downfall of his people is intended as a lesson for us today. Indeed, Mormon addresses us directly and with full knowledge of our own situation: “O ye Gentiles, how can ye stand before the power of God, except ye shall repent and turn from your evil ways?” We as a people and as individuals are just as much at risk of destruction as Mormon’s people were. It is perfectly possible for each of us to travel the same downward route the people of Lehi traveled. After all, at one time “they had Christ for their shepherd.” As we point with alarm at the worldly trends around us, we should never forget that we ourselves, no matter what kind of testimony we have or faith we hold to, are vulnerable. Are we lifted up in pride? Are our hearts set on fine apparel and the vain things of the world? Do we have enmity for others? Are we “class conscious,” filled with contempt for people who disagree with us or live in different ways? Do we engage in predatory business practices? Is money our god? Are we warlike, abusive, hateful, vengeful, delighting in the destruction-moral, physical, or spiritual-of other people? If we are any of these things to any degree, we have need of repentance. There is absolute security in the Savior. As Mormon pointed out, if his people had repented, “they might have been clasped in the arms of Jesus.” And that is the promise to each of us. Imagine yourself clasped in the arms of Jesus, and then consider what you would give in exchange for that experience. Teach a Gospel Doctrine class. Draw much from the lesson-related articles. Many thanks. Would be helpful if articles included scripture references.